Introducing the New Horn Quilters Delight MK2 - 2032 and it comes fitted with the Horn Maxi air-lifter. This new cabinet from Horn is ideal for the new extra large sewing machines such as the New Bernina 800 series, Brother Innov-is 1e, Janome Horizon 7700 and the 12000 amongst others, but it’s not just for larger machines it’s also ideal for all normal sized domestic sewing machine too! The Horn Quilters Delight Mk2 has a large working area positioned all around the cabinet which is designed to support even the largest projects not only that there is also a handy mobile set of drawers which when stored sits neatly inside the main table, so reducing its floor space, but when pulled out it can be moved on its castors in relation to where's best for you. On the back of the Horn Quilter's Delight Mk2 is a large foldable work area. 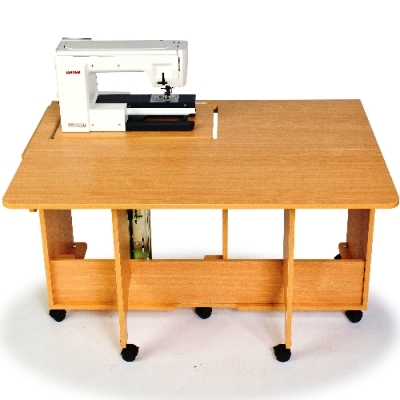 This work area is ideal for supporting larger items like quilts and curtains while sewing and this area can also be used as a cutting area when the machine is not in use. 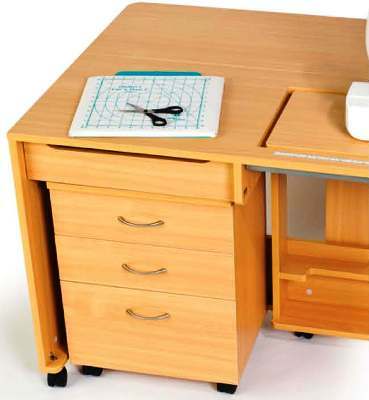 The Horn Quilters Delight Mk2 opens up to offer you not only a huge supported work space every where you need it but a great deal of storage too! It also comes with a filler panel which sits in the machine opening when your machine is stored away, so with the back area up you create a large solid cutting area. 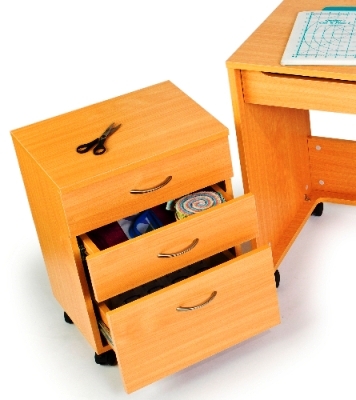 You can also add to your Horn Quilter's Delight storage with the Horn Rolla Storage Unit. Due to the size of this unit the driver is unable to postion this cabinet upstairs.